As the only hospital in Quebec and one of only two in Canada to use a linear design for its Emergency Departments (ED), the pediatric and adult EDs at the Glen Campus will be as cutting-edge as they come. The central core of the ED design is where staff works. 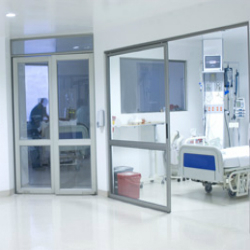 It is an open area adjacent to the treatment rooms that allows personnel to visually monitor patients as well as see and interact with each other and provide assistance as needed (sliding glass doors allow for clear sight lines into the treatment rooms). Since the clinical work area is separate from the patient and family zones, interdisciplinary collaboration and teaching are enhanced. However, both doctors caution against thinking that this will solve the problem of wait times in ERs, “we still have a maximum capacity that must be respected, and we still have to work on better interaction with ambulatory services like CLSCs” says Dr. Eisman, but with a more streamlined ER, the time it takes to actually process a patient and decide what care needs to be administered may be faster. The new ED design at the Glen Campus is one of the most modern in the health care system and one that is sure to promote improved care.